as a stunning addition to your collection, we have this petite squash blossom style necklace! 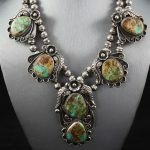 It is made of sterling silver and features large cabochons of Royston Turquoise on the pendant and two decorations on either side. Each piece also has beautifully carved feathers and flowers trailing down the sides, as well and other organic decorations. These are all hung on a double strand of sterling bench beads. 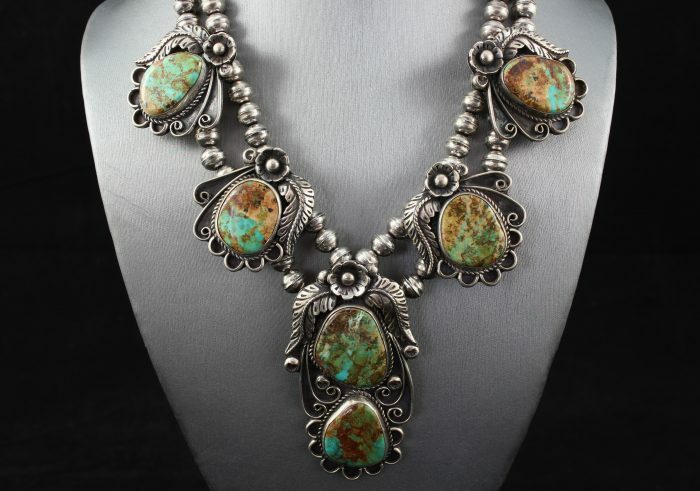 This necklace is in great condition, with minor surface wear and a light patina. Please see “Image Gallery” for more pictures!